If you’re seeking the tranquility and serenity of life on Allison Island with the best of South Beach luxury amenities, then look no further than Aqua Allison Island. Nestled between iconic South Beach and the serene La Gorce Island, Aqua Allison Island was designed to maximize the natural surrounding beauty while still offering you the cosmopolitan urban lifestyle you’re used to. The Aqua community is comprised of three mid-rise waterfront luxury condominiums, and 46 additional island homes. Constructed with an all star team, Craig Robbins of Dacra Development spearheads the project designed by a team of respected architects Alison Spear and Alexander Gorlin. Each 11-story mid-rise luxury condominium currently has two, three, four, and five bedroom floor plans available for purchase. Two bedroom units start at just $875k and offer 1,755 square feet of living space, while the largest five bedroom units sell for $5.2M with a whopping 5,349 square feet of living space. Interiors at Aqua Allison Island were designed with public art from some of South Florida and the world’s most celebrated artists. As you would imagine, ten foot ceilings come standard in every unit, as well as wraparound balconies and private garages. Sunscreen shading provides you with the outdoor space and comfort to lounge, entertain, cook, or dine outside. Kitchens come with name brand designer kitchen fixtures, Baulthaup wood kitchen cabinetry. Bathrooms come standard with Duravit water closets and bidets and Waterworks whirlpool tubs. Interior design schemes are planned to match the common areas and art selection for a seamless and unique look. 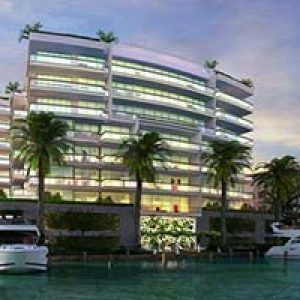 In addition to the benefits of living in a private and secluded neighborhood, life at Aqua Allison Island still offers the very best in community amenities as main-island luxury condominiums. Twenty-four hour monitored security keeps the entire island and your family and property safe. A state-of-the-art fitness facility, complete spa services, and a children’s play center are available for your use. If boating is your passion, Aqua Allison Island has private boat slips available to accommodate vessels of any size. Private pools for adults and children are surrounded by beautiful pool decks and mango groves. In addition to the wonderful amenities inside the Aqua Allison Island community, you’ll be surrounded by the beautifully landscaped St. Francis Square Park complete with original sculptures and pedestrian jogging paths along the waterfront. Just a short walk over the bridge to Miami Beachgives you instant access to Miami’s iconic white-sand beaches. Just a short walk west brings you to La Gorce Country Club, one of the most beautiful golf courses in the country. In addition to this great neighborhood, Aqua Allison Island is just a short ride to Miami Beach’s and Downtown Miami’s very best in dining, entertainment, nightlife, and culture. Quick access to I-95 and US-1 makes travel to airports and other vibrant South Florida communities a breeze. There is nothing like having your own piece of tropical island paradise while still experiencing the best MIami luxury living has to offer. Don’t miss out on this unique property offering at Aqua Allison Island!